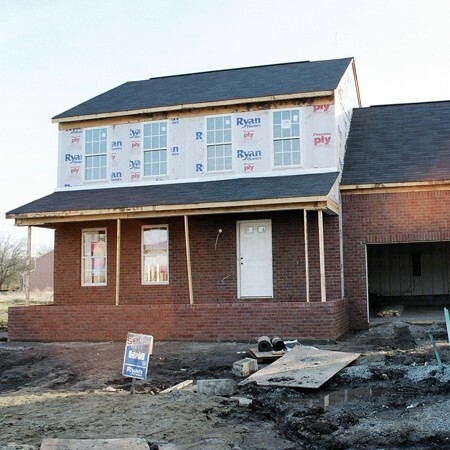 The following photos document the process of building our first home together in Franklin, Tennessee. It’s a stick-built house, as opposed to the log home that we started building 6 years after we finished this one. For the complete story on building our log home, start with the oldest posts here. We started to design our first home soon after our marriage in December, 1999. We had a huge collection of ideas and things we liked — both from the Internet and in magazines — and we learned all about the process of building a home from scratch. The only thing holding us back was our decision of where (which state) to build in. Everywhere we’ve lived, we’ve made a habit of checking out the local “Parade of Homes” — driving around different parts of town, visiting different neighborhoods, and familiarizing ourselves with the different home builders. A month after we moved to Nashville, we started our search for a new home in the Nashville and Franklin areas. We spent the next 7 months, on and off, exploring neighborhoods and meeting with different builders. Oddly enough, the very first subdivision we looked at was the one we eventually decided to build in. This photo was taken the day we signed the deal with Ryan Homes to build our home on this land in Franklin, Tennessee. It was December 1, 2001, and it was the final phase of the Franklin Green subdivision. The salesman is showing us exactly where our house will go on this particular piece of land. The builder, Ryan Homes, was the 7th largest in the country with a 9% market share of the new house market (approximately 3,000 homes/year). They started building in this particular subdivision (Franklin Green) in 1998, and the final phase sold out in 2002. We bought during the Final Phase — with only 17 houses left to sell. We were the 4th to build on this road with a cul de sac. Now that all of the houses are built on this street, we’ve never regretted for a moment our choice of this particular lot. It truly is the best. This piece of land where we chose to build hour home was larger the most others on the same street. And, it bumps up next to a large “common area” (where the tree is), so it makes your own yard look even bigger! This old tree isn’t so attractive in the winter time, but in the spring and summer — when it’s in full bloom — it shadows over our side yard providing a lot of needed shade. 1/22/02 was the first activity on site (2 weeks later than scheduled). The lot was graveled to prepare for footing. Here, 4 days later, the cinder blocks were laid to create a foundation for our house. We visited the site often, even before there was any activity on our lot! We kept trying to reassure ourselves: a) that we’d made the right decision to buy in Franklin, and b) that we’d selected the right lot, rather than one further in the cul de sac. Even before the building began, we were excited by the small things: Fresh bulldozer tracks in the dirt– evidence of leveling the land or plotting the corners, etc. And a live meter added to the temporary electricity pole on our lot — which signaled that they were finally about to start on our house. Once the building of our home actually began, we started visited regularly to monitor the progress — usually at night since Jim worked late most days, plus it got dark early during the winter months. In fact, they were moving so fast on building our house that in order to get good photos during daylight hours we had to get up at the crack of dawn to check it out before heading to work. (Which was a drive way out of the way from where we were currently renting a home, but it was worth it.) We also received bi-weekly progress reports from the builder via telephone. They were just as excited to see it finished quickly as we were. 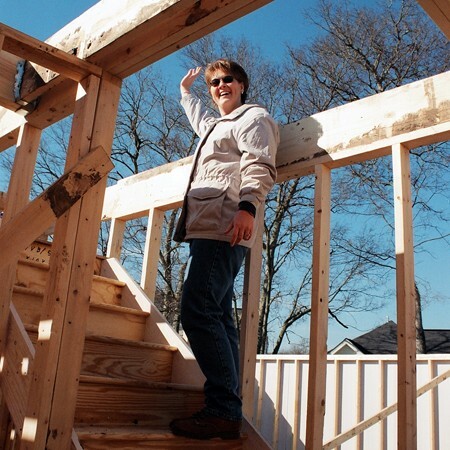 2/2/02 – The framing of our house was begun. In fact, the entire first floor was framed in one day! At no time does the construction process seem faster than during the framing of the house. I’ve always been one to think outside the box, so how appropriate that our new house fit that same mold! A view of the rear of our house — taken on the morning of the Nashville Blizzard. 2/10/02 – We visited the entirely closed house for the first time. The interior walls were taking shape — forming a skeleton for the inside of our house. As well as the windows and doors, all of the sub-walls and sub-floors were in place. So this was the first time our entire house was fully enclosed and protected from the elements. Jim also noticed that the rough-ins had begun for all the lights and outlets. This was our last time seeing the house before it was bricked on the outside. Actually, it’s part brick and part vinyl siding. Did you know that brick costs 7% more than vinyl siding? It’s well worth it, but we chose to put our extra dollars into a porch instead. 2/15/02 – This was one of our last meetings with the Ryan Homes building supervisor, Shawn Anderson. He needed our final approval for the placement of electrical outlets, telephone jacks, cable connections, etc. My mom happened to be in town, and she went with us to see the house. On this day, they were also finishing the siding. 2/22/02 – The brick was finished on the outside. Our house is part brick and part gray vinyl siding. In fact, it’s the only house on our entire street with gray siding (see below). We should’ve gone ALL brick, but we couldn’t afford it. Brick stands the test of time, and it offers curb appeal. It’s the best exterior product on the market for durability and resale value. Brick is virtually maintenance free — it won’t rot, fade, or warp, and it never needs painting. Brick holds up to all weather conditions and provides excellent insulation properties — it absorbs heat slowly, then slowly releases it. In the summer, brick absorbs the heat, keeping your house cooler. In winter, it holds the heat and radiates it back, keeping the house warmer. Where’s The Clean Up Crew? 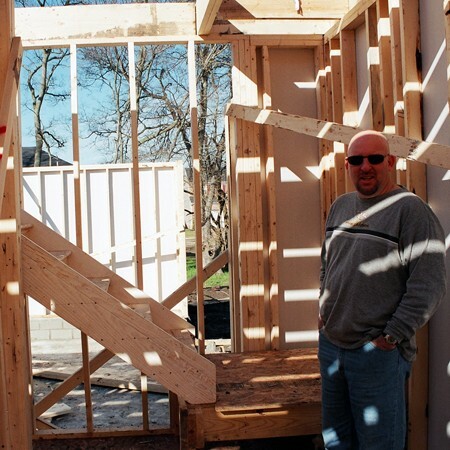 3/6/02 – Here, you can see that the drywall was up in all rooms of the house. As the drywall went up and the flooring went down, our new house started to feel like a home. At this stage of construction, the architectural nuances that had existed only on paper started to take shape before our eyes, and we could almost hear the furniture-moving trucks idling outside. Here I am (looking like a mobster) checking out the inside of the house. 3/13/02 – Jim’s checking out the completed siding job from the back of the house. They put locks on our house for first time (because cabinetry, tools & trim were being stored in there now). Also, our hardwood floors were installed at this point, as were the bathroom cabinets, kitchen cabinets, bathroom tubs and marble vanities. We also learned that on 3/9 that the first coat of paint inside was completed. Then on 3/10, the second (and final) coat of paint was completed in the house. As far as our preparation… on 3/1, we called the mortgage company to lock in the mortgage rate, and on 3/3, we started packing for moving day in early April. They’re getting ready to put in the driveway now. 3/22/02 – Since the house remained locked at all times (thankfully), we were thrilled to discover some workers there when we visited this time, so we got to check out all the work that had been done on the inside. For the past week or so, we’d only heard about all the changes via phone reports from the builder, but the place had always been locked whenever we happened to drive by. At this point, all of the window and door trim was completed. Baseboards were in. And the dining room crown molding and chair rail were in. We were just itching to move in now! 4/1/02 – We were lucky to have such a great building supervisor in charge of our home. Shawn was very detail-oriented, and catered to our every wish. This was the final walk-through with him to complete the “punch list” — all the little things we still wanted to have done (or fixed). At this point, they had also poured the concrete for the driveway, sidewalk, and porch. The only things yet to appear were the pillars for the front porch, the mailbox, and the landscaping. Jim’s checking out the electrical box in the garage. By the way, something that always seems odd to people who don’t live around here… you’ll notice in many Tennessee homes the garages are only partially ‘finished’. Notice that piece of drywall up to and surrounding the electrical box? That’s the bare minimum that’s required by law to ‘finish’ and still get a Certificate of Occupancy to move in. Putting drywall over all the studs in the garage would have cost a lot more, so most new homeowners just leave it partially finished like this. Jim’s brother, Steve, helped us pick out the right furniture style for our new home. We got most of our furniture at a place called Sofa Connection. The funniest thing is the fact that Jim and I were set to purchase this exact set they’re sitting on — and in the exact colors you see here: primaries! The sofa was bright cherry red, the loveseat was deep royal blue, and the chair a sunshine yellow. We were trying to break from our “conservative” mold, and this surely would have done it, but we were so grateful that Steve came and saved us from such a purchase! We all agreed that the style of this set was perfect, but just not the fabrics. They say you should opt for a large chair & ottoman (rather than a loveseat), in addition to a sofa and another chair. And when in doubt, go bigger, taller, wider for your furniture pieces! Likewise, you should choose a solid color for your main piece (like the sofa). 4/12/02: It’s ours! We’ve just returned from signing on the dotted line and closing on our house. Here, Jim’s talking with the building supervisor for Ryan Homes about the final finishing touches. In just under 80 days, our house went from nothing to something. The builder said that 72 days to build in Tennessee was a record for his company! (FYI, on average it takes 90 days to build a new home. Custom homes take about 6 months). We decided on the lot and the house 12/1/01. We saw the first activity toward building our house on 1/26/02. It was ready for move-in on 4/12/02. 1. When we were zeroing in on our choices of who to build with, where to live, etc. we had the full attention of all the salespeople — because they hardly had any other people visiting. We were treated like royalty by all of the different builders we visited. 2. Once the building process actually got going, it went really quickly due to the fact that they only had one other house to build at the same time. There simply isn’t a lot of construction going on during the winter months in Tennessee — typically. So, we were treated like royalty by the builder, and he had more time (and willingness) to meet our special last-minute requests, etc. 3. It makes the dreary, winter months go by faster when you have something like a new home in the Spring to look forward to! Every day was filled with exciting new aspects about our future home. And if you start in December like we did, what better Christmas present to give yourself than a new house?! Want to see how we painted and decorated this home? Here’s a little about all the homes that Jim and I have built.